I’m still celebrating the release of Born at Midnight, and, boy, do I have a special surprise for you—two, never before seen Shadow Falls scenes from the day Kylie arrives at camp. One is from Derek’s point of view, and the other is from Lucas’s. Click here to read them both. Yay! It’s Release Day for my new baby, Born at Midnight. I’m tossing confetti and it’s going everywhere, including my coffee cup, but I don’t care. It’s Release Day! Woo hoo! Tweet My Book and Win a Kindle! To celebrate the release of Born at Midnight, Book 1 of my new Shadow Falls series, I’m giving away a Kindle. But that’s not all! Three more lucky winners will receive an ARC of Awake At Dawn, Book 2 of the Shadow Falls series, as soon as the ARC is available, which will probably be in June. Because I’m in the giving mood, I’m also going to give away a copy of Born at Midnight to three more winners. So that’s seven winners total! It’s super easy to enter my Tweet My Book and Win a Kindle contest; all you have to do is tweet about how you can get a sneak peak at Book 1 in my Shadow Falls series, Born at Midnight. And I’ve even written the tweet so all you have to do is click the button marked “Tweet and Enter.” Told you it was super easy to enter. Contest ends March 29th, 11:59 p.m. Winners will be announced April 1st on my C.C. Hunter blog, with an accompanying alert on Facebook and Twitter. NOTE: If prizes are unclaimed after one week, another winner will be chosen. Sixteen-year-old Della Tsang had never seen a ghost until she saw her dead cousin zip across the street and duck into the alley. If it hadn’t been for the streetlight spitting out its spray of wattage overhead, she might have missed him. And if it hadn’t been for a scar that ran along his chin, she might have thought it was just someone who looked like Chan. Then again, it was after midnight. But she had spotted the scar. A scar she’d sort of given him when they’d been six, jumping on the trampoline and he’d collided with her head. Hardheaded Della had been her family nickname after that. Sometimes Della wondered if she’d really been obstinate then, or if the name had just been another thing for her to live up to. Being of Asian descent, there were high expectations, sometimes too high. But because she and her sister were half-white, her father insisted they work twice as hard to prove that their parents’ love hadn’t tainted the family tree. A pair of headlights moving down the road pulled Della’s attention from the alley where Chan had disappeared. Not that she completely believed it was Chan. Did she? The car drew nearer, and thinking it was Lee to pick her up, Della stepped off her best friend Lisa’s front porch, leaving the sound of the party still going on behind her. At least twice a month, Della and Lee tried to sneak away so they could be together for an entire night. She knew her parents would freak if they knew she and Lee were sleeping together. It wouldn’t even matter that they were practically engaged. But at least Lee had gotten a stamp of approval from her father. Luckily, she agreed with him, too. Not that she agreed with her father on everything. However, Lee was everything Della wanted in a boyfriend–hot, popular, smart, and thankfully for her father’s sake, Asian. It didn’t even bother her that Lee wasn’t totally into the party scene. She gave the alley one last look. It couldn’t have been Chan. She’d attended his funeral less than a year ago. I’m Here, There and Everywhere! Waiting for a book to release is a lot like waiting to go into labor with a new baby. By that, I mean it’s a blend of excitement and fear. Honestly, if I had any fingernails left, I’m sure I would be biting them down to the quick at this point. LOL. Thanks to some fabulous bloggers, though, I’ll be too busy the next few days to worry about the birth of my “baby,” Born at Midnight. Yay! I’m celebrating today because my short story Turned at Dark, which introduces my Shadow Falls series, is available for free eBook download today at all major online retailers. 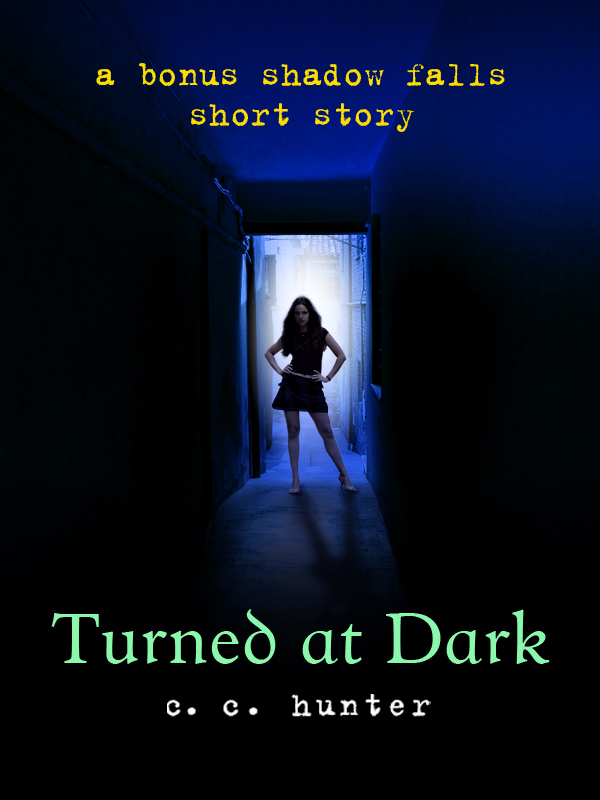 Turned at Dark is Della’s story, and explains how she became a vampire. And did I mention it’s free? So, what are you waiting for? Go get your copy! The New Covey Trailer Awards has announced their March nominees, and I’m so honored that they’ve included the gorgeous video Firebird Media Management did for Born at Midnight. Go check out the list of nominated book trailers here, and vote for your favorite. Voting ends at midnight on March 30th. Good luck to all the nominees! Hey…I’m over at http://awesomesaucebookclub.blogspot.com/ and I’m giving away more prizes. Go check it out! The winner of the $15 gift card is Jessica Hansen! Jessica please e-mail me at cc(at) cchunterbooks (.) com and give me your mailing address. And guys, please stay tuned. More prizes and giveaways coming up really soon. Okay…here’s another contest. All you have to do is post a comment on my blog about what kind of supernatural you would like to be and one lucky poster will win a $15 gift card to B&N. Want to win a free copy of my short story, Turned at Dark, along with the first three chapters of Born at Midnight, my Shadow Falls novel that releases March 29th? Do you want it really badly? Okay…You win! That’s right. Everyone wins. Turned at Dark is a free download at Amazon, Barnes & Noble, Borders, and where ever e-books are available. You can also read it at the Born at Midnight page at my publisher. Here are some links to three of the online retailers. Independent and strong-willed Della Tsang hadn’t believed in ghosts until she saw her dead cousin darting into the shadows of an alley. She hadn’t believed in vampires until in the dark of that same night she is turned into one. Introduced to a strange world of supernaturals, she struggles to accept this new reality. Unfortunately, the boy she loves senses something different about her and can’t accept her. Should she follow her vampire cousin’s lead–walk away from everything she’s knows and loves—and fake her own death? Or should she set her pride aside and ask for help from the camp leader of Shadow Falls—a camp where supernaturals go to learn how to cope with their powers. Either way, her life as she knows it, will never be the same. Oh, one final thing! Next week, on March 22nd to be exact, I’ll be launching my “Tweet my Book and Win a Kindle” contest, which I’m running to promote the release of Born at Midnight, Book 1 of the Shadow Falls series. One person will win the Kindle but I’ll also be giving away three copies of the book, some swag and three copies of the ARC for Awake at Dawn, Book 2 in the series. The contest runs from March 22 through March 29th, and all the details will be here at my blog next Tuesday. Mark your calendars!